It seems that the theatrical release of Chinese war drama Air Strike, also known as Unbreakable Spirit, has been canceled. This comes just nine days before the film - which was originally set to co-star Chinese actress Fan Bingbing until she became involved in a major tax evasion scandal - was to hit theaters in North America and the Chinese mainland. 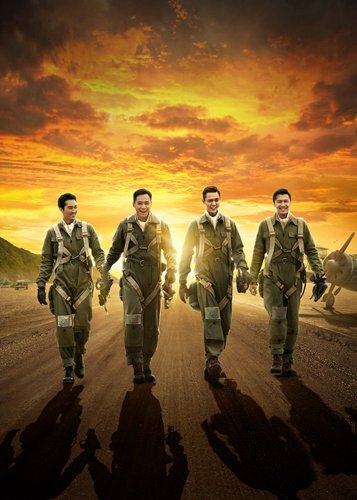 Starring Bruce Wills, Liu Ye and Song Seung-heon and directed by Chinese director Xiao Feng, the film tells the story of Chinese pilots who fight to save the city of Chongqing and its citizens from Japanese air bombings during World War II. The news of the cancelation started with a Sina Weibo post from the director on Wednesday that implied the film wouldn't be released in cinemas. "Even more truth can't mend the situation… It's time to let it go, though letting go is not about giving up. I just feel sorry for Air Strike, my child that I've fostered for eight years… My apologies to my partners and the distributors who supported me and also to audiences who were still looking forward to seeing the film," the post read. Following the post, Chinese entertainment platform Sina Entertainment said in an article that it had contacted the film's marketing team, who confirmed that the film was canceled. However, no explanation was given as to why. As of Thursday afternoon, no official statement has been released by the film's representatives, but netizens suspect that the cancelation has something to do with Fan's recent tax evasion scandal. Back in June, former Chinese host Cui Yongyuan called the film a "big fraud" and accused the producers of the 300-million-yuan ($43 million) budgeted production of financial fraud and helping Fan avoid paying taxes. Although the film's representatives denied the accusations, they led to the State Administration of Taxation and the Jiangsu Provincial Tax Service to conduct an investigation. According to a report from the Xinhua News Agency on October 3, the investigation determined that although Fan was paid 30 million yuan for her role in the film, she only declared 10 million yuan, thus evading 7.3 million yuan in taxes. The actress was later fined more than 800 million yuan for tax evasion and other offences by Chinese tax authorities in early October. This is not the first time the film has suffered release date troubles. While the film was originally scheduled for August 17, on August 7 Fan's name and image were removed from the film's marketing materials and new posters featuring Willis, Liu and Song were released with the explanation that these were the stars that "have major scenes in the film." That same day, the film's official Sina Weibo account announced that the film's release date was being delayed to October 26 to match the North American debut. "Even if the film is finally released, I won't go see it in the cinema. Support Mr. Cui [Heart]," commented Sina Weibo user I Am Manana under the post. "The director made no mistakes, and neither has the film. We shouldn't blame the creators. After all, they're the ones who made all the sacrifices. The investors should be blamed," commented another netizen LuckyAyaner. "I still believe that all roads will eventually open to good people. If the celestial gods are witnessing what is happening, there surely will be retribution for those who deserve it," Xiao Feng wrote in his post on Wednesday.